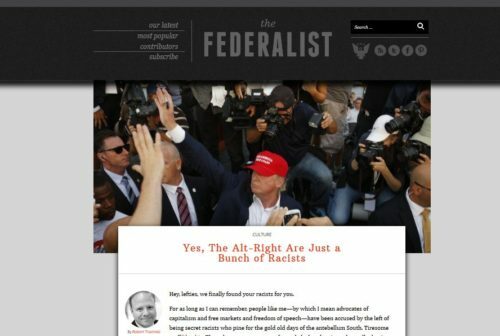 The Alt Right is busting out all over (two more Main Stream Media attacks today, here and here)! Some of of this is because Richard Spencer, head of the National Policy Institute, made the wise move of having high-profile public meetings in Washington, DC. But I think it’s more than that. Donald Trump’s candidacy has resonated deeply with voters, to the point that his supporters are famously immune to the hostile MSM barrage. Mainly these are the (white) people who have been left behind by both parties—the Democrats and their Rainbow Coalition of the racially and sexually aggrieved advocating ever more immigration, multiculturalism, Political Correctness, and LGBT privileges; the Republicans with their unholy alliance between neoconservatives traitorously promoting the interests of Israel, and the Chamber of Commerce/K Street/wealthy donors promoting free trade, outsourcing, cheap labor, Open Borders, etc. That leaves the Alt Right as the only identifiable segment of the political spectrum with any kind of theoretical or ideological grounding that supports Trump. And are Jews in Israel who worry about their demographic future and design their immigration policy to remain a Jewish state “supremacist”? Are Japanese“supremacist”? Well, as an academic, I often asked my classes to imagine a species, or an individual, who decides that all that “nature red in tooth and claw” stuff is mean and cruel. All those others continue to band together with their co-ethnics and, yes, these groups are forging ahead and successfully promoting their interests, such as expanding their territory. The territory of the altruist (because that’s what he is) is shrinking, but the altruist, if a writer for The Federalist (or National Review), can make a comfortable living condemning the moral turpitude of those who take the game of life seriously. But the altruistic species is obviously going to lose. Evolution is like that. This is idiotic, based solely on a Tweet by an anonymous Tweeter. (Although—long story—as an evolutionary psychologist, I would argue it’s not really irrational at all; e.g., marrying someone from a similar ethnic background makes you more closely related and hence more similar to your children). What if Tracinski is wrong and individualism and collectivism are more than skin deep? What if, e.g., the individiualism-collectivism trait is influenced by heritable personality traits (e.g., here and here)? Isn’t it obvious that Trump is right to ban Muslim immigration because doing so is in America’s collective interest? Apparently Tracinski can’t or won’t understand that individualism works well when pretty much everyone else is playing the same game. But it’s a disaster in competition with collectivists, particularly intelligent, highly networked collectivists. Thus the concept of America as a white, Christian, European-derived civilization underlying the 1920s immigration restriction laws was gradually replaced by the“Proposition Nation” concept (another major theme of The Culture of Critique). The 1920s laws basically said that the US desired to remain a European nation by biasing its immigration toward Western Europe. It was a fundamentally fair assertion of the ethnic status quo as of 1890. And it was profoundly collectivist. This sea change in American identity is the result of a rather recent and far-from-inevitable process. Ideologues like Tracinski are the ones with no sense of the complexity of American history, American identities, or the Western tradition. They are projecting their ideology into the deep past by imagining a history that never existed. Because of the dominance of the Left and its obsession with “White racism,”Cuckservatism in all its forms tries to fly under the radar of Political Correctness by aggressively signaling its moral abhorrence of “racism.” This makes Cuckservatives respectable upholders of the status quo—and “willing executioners” in the transformation of America into something that would be unrecognizable and abhorrent to the Founding Fathers.